Stock # PH4285, 350 ci V8 Engine, Automatic, 10254 mi. Check out this 1946 Chevrolet 3100 Pick Up we have at Classic Motor Cars. This 46 truck has been beautifully restored. It has been equipped with a small block Chevy motor and an automatic transmission. It drives very nice with the Camaro front clip, power steering, and power brakes. The vintage A/C blows cold. The body has been restored and painted with turquoise with pearl ghost flames, and the bed has new wood planks with painted metal strips. 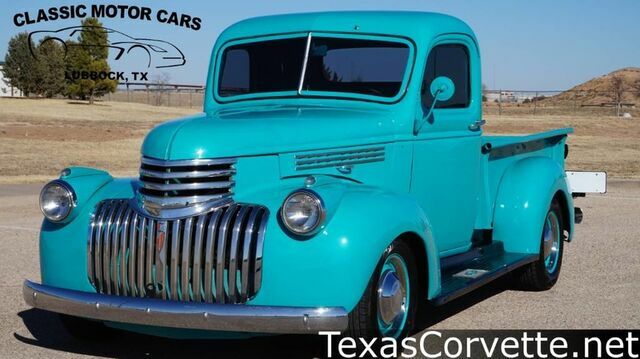 If you would like more information on this 1946 Chevrolet Pick Up, call us at (806)792-4699.